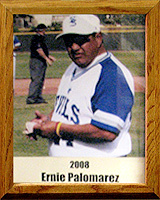 Ernie has been a baseball coach at the high school and youth-league level for 29 years. As coach at Sunnyside High School, he was named Tucson Citizen Coach of the Year (1992, 2003), Arizona Daily Star Coach of the Year (1992, 1994, 2003) and the Arizona Baseball Coaches Association All-Star Coach (1992, 2003). His Sunnyside teams were Class 4A state runners-up in 1991 and 1994 while also reaching the state semifinals 15 times. The 1991 team was ranked 28th in the nation by Collegiate Baseball. Sunnyside won 4A Sonoran Region championships in 2002, 2003 and 2005. He also has coached in American Legion, Mickey Mantle, Colt League and Pony76 League, as well as ASA Softball simultaneously with baseball. His summer league teams have won many state and regional tournaments. Ernie also graduated from Sunnyside in 1973 and played basketball as well as baseball. He was second-team All-City his junior year and first-team All-City and honorable mention All-State as a senior in baseball. He also played for the first-ever baseball team at Pima Community College. Ernie went on to Northern Arizona University where he played baseball in 1977 and 1978 and was a graduate assistant coach in 1979. He has served with many committees for baseball as well as civic groups in the Sunnyside community.